Hello foodies! here comes the time when we have to say ‘good bye’ to winter and tomorrow is the last festival of this winter - Vasant Panchami or Saraswati Puja! In India, it is a very important and popular festival, not only for students, but also for each and every people. 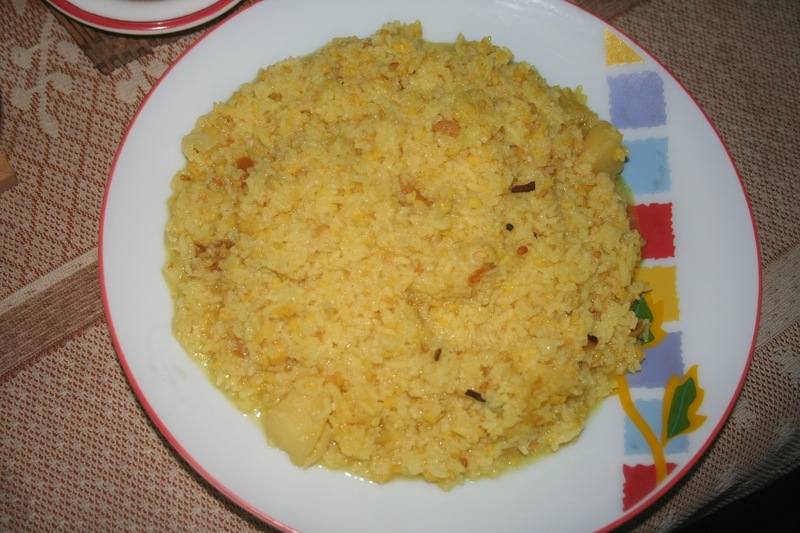 It is a must have for all Bengali to eat a special ‘Khichdi’ on the day with various side dishes! Today, I’m going to share the recipe of this special Khichdi! Try it tomorrow, I think your family will love it…………..
Cut the potatoes in halves. Cut the cauliflower in 8-10 large florets. Wash the rice and soak in water for 10 minutes. Roast the Moong Dal till golden and you get a nice aroma. Rinse the dal lightly in water and keep aside. In a frying pan, fry the potatoes and cauliflower with sprinkle of turmeric powder and salt till they are f lightly golden. Throw in the green peas and sauté them too. Now, heat oil in a deep and heavy bottomed pot. Add the ingredients, mentioned for tempering, one by one and sauté for a minute. Add ginger paste and mix it well and let it cook for 2-3 minutes. Add the rice and mix it well. Let it cook for 2-3 minutes. Add moong dal and stir for 1-2 minutes for proper mixing. Now, add salt, turmeric powder and water (1 liter) and let it boil. After the boiling starts add the potatoes, cauliflower, green chillies and peas. Add some more warm water if needed. Cover the pot and let it cook. In between, remove the cover, gently give a stir and check if they are done or if more water is needed. 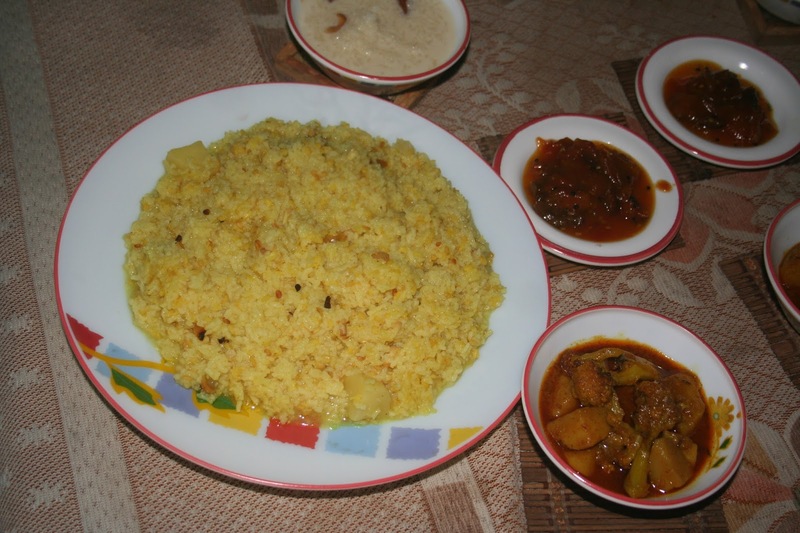 Once the rice, lentils and vegetables are cooked, add the sugar and mix gently. 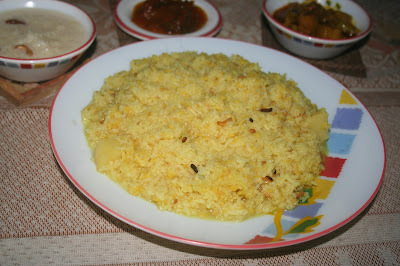 Drizzle the ghee and serve hot.